Boasting a subtropical climate, boats to rent or charter, eight public boat launches and great cook-your-catch restaurants, Gulf Shores and Orange Beach are ideal areas to drop a line and reel in dinner. Best of all, these fantastic fishing opportunities are just a short distance from Turquoise Place Resort in Orange Beach, AL. If you decide to go Orange Beach fishing during your next beach vacation, browse these tips for catching a great time. A fishing license will be needed if you’re fishing from the pier or shore, or from your own boat. If you’re booked on a deep sea fishing charter, the captain will take care of your license. Licenses can be obtained from some area marinas and even Walmart. You can also purchase an Alabama fishing license at the Gulf State Park pier or online at Outdoor Alabama’s website prior to your Orange Beach fishing vacation. The sun is bright, so be prepared with plenty of water and other hydrating liquids. Throw some washcloths in the cooler for folks feeling the heat too much. Pack protein-packed snacks that will curb your appetite and provide energy. Sunscreen is a must when participating in outdoor activities on the water. Hats are helpful, especially wide-brim fishing hats. Also, dress in layers and light colors to aid the body in staying as cool as possible in the summertime. Don’t forget the sunglasses, too! Bait and tackle are available at Gulf Shores and Orange Beach marinas, but if you’re booked on an Orange Beach fishing charter most everything is included. Ask when you book to be prepared. If you are bringing your own boat, you’ll want to know where you can store it until time to put in the water, and there are several options. Guests of Turquoise Place looking for boat storage during their Orange Beach vacation need look no further than Zeke’s Landing. Zeke’s is convenient and offers dry storage for up to 220 boats. They have on-site professional mechanics, dockside fuel, and a fully stocked dock store. A 30-minute advance call when you’re ready to use your boat will be all they need to have it ready to go and docked for you! Zeke’s Landing also offers quite a few charter boats, including a shared-expense deep sea fishing excursion. For more information, call (251) 981-4044. When you’re on an Orange Beach vacation, The Wharf Marina also offers overnight slips. Boat in, grab a bite to eat from an Orange Beach restaurant and browse the specialty boutiques and shops at the complex. Call (251) 224-1900 for fishing opportunities on The Wharf Marina. If you’re vacationing at a Gulf Shores resort like The Beach Club Resort & Spa on the Fort Morgan peninsula of Gulf Shores, check out Ewing Place on Fort Morgan Road for boat and RV dry storage. There are also eight public boat launches located throughout Gulf Shores and Orange Beach, so no matter where you’re staying, there’s a launch near you. If you need a marina or a transient boat slip in Fort Morgan, try Gulf Shores Marina. It’s a full-service marina with indoor dry storage and wet slips as well as dockside fuel, a charter fleet and it’s home to the Tacky Jacks 2 restaurant. Pick up everything you need for a day on the water at the Dock Store before heading out. You can also store your boat trailer here, as well. For those vacationing at Fort Morgan condos, Gulf Shores Marina is a great option. Contact (251) 540-2628 for more details. The pier at the Gulf State Park is the second largest on the Gulf of Mexico and is a great place to cast from. You’ll see lots of anglers fishing, along with families who have small children. An indoor concession area and the retail store sells drinks and snacks, souvenirs and tackle. You can also purchase a saltwater fishing license at the store. For more details, contact (251) 967-3474. Shore fishing is a newfound treasure for many folks while other anglers will tell you they’ve been doing it for ages. No fancy equipment is needed for this Orange Beach fishing, just a rod and reel, some bait and a license. Wade into the water or stay on the beach, either way, is acceptable. What better place to shore fish than Orange Beach with its 32 miles of beautiful beaches. Did you know Orange Beach has one of the largest charter fishing fleets and artificial reef programs in the country? 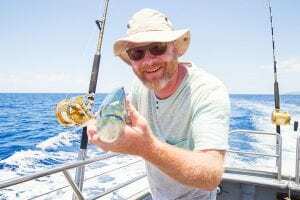 Charter fishing is a great way to have a hassle-free fishing trip. 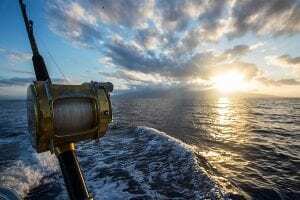 The captain will provide all you need: bait and tackle, fishing license, equipment and helpful deckhands. Call nearly any marina to book a charter with an experienced captain for a four- or eight-hour fishing trip. Overnight trips are also available. Contact 1-800-745-7263 for more information on Orange Beach charter fishing. For an adrenaline-pumping Orange Beach fishing adventure, book a bowfishing trip. It’s an experience like no other on Alabama’s beaches! Board your captain’s flat-bottom boat equipped with LED lights and get ready to hunt your next catch. While the most successful bowfishing is done at night, captains with Liquid Trails and Fish-Kabob Bowfishing say the fun isn’t reserved just for evening hours. Day and night charters are available in Orange Beach, Gulf Shores and Perdido Key, Fla. Your captain will provide an assortment of bows and will instruct you on shooting or gigging your fish. Species of fish you may catch on these inshore charters include sheepshead, flounder, mullet, black drum, skipjack, cownose rays, butterfly rays, and stingrays. 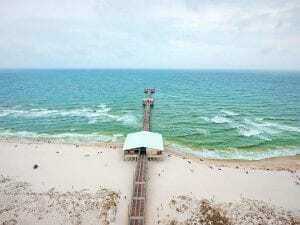 An Orange Beach fishing vacation along Alabama’s gorgeous beaches and waterways are easy when you know the tips and tricks. It’s good to know your options in advance for planning and prep work. Check out Fishing 101 for good information. 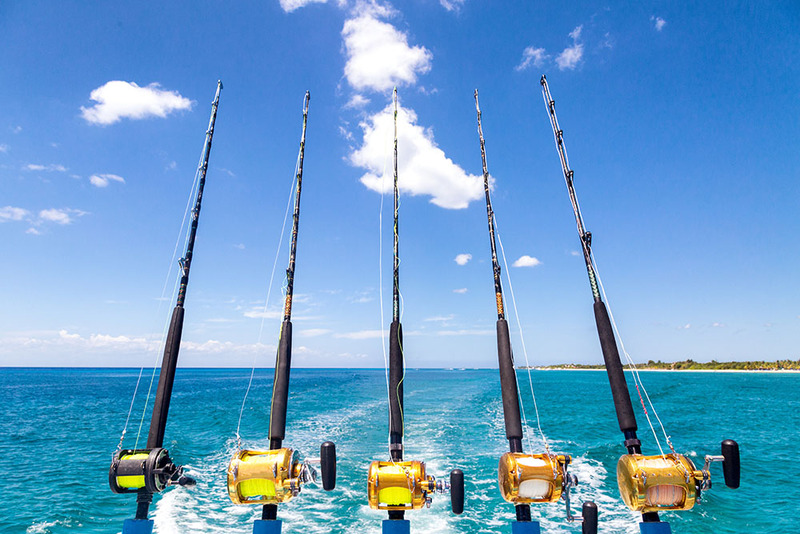 Luckily, no matter your skill level or knowledge of fishing, there are plenty of great options for families, couples or solo travelers whether you’re bringing a boat of your own, chartering a deep sea fishing trip or simply fishing from the shore or pier. Get your fishing getaway started by booking your Orange Beach vacation rental at Turquoise Place Resort!